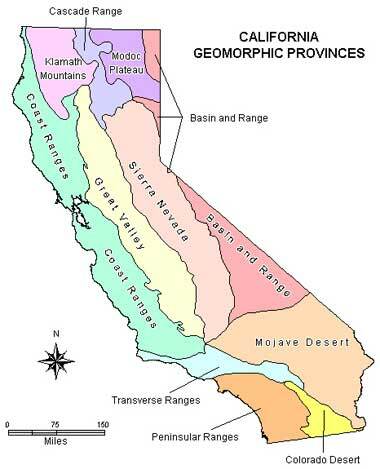 California's geomorphic provinces are naturally defined geologic regions that display a distinct landscape or landform. Earth scientists recognize eleven provinces in California. Each region displays unique, defining features based on geology, faults, topographic relief and climate. These geomorphic provinces are remarkably diverse. They provide spectacular vistas and unique opportunities to learn about earth's geologic processes and history. Note: Although the Mojave Desert resides chiefly in its own geomorphic province, the Mojave's botanical boundaries overlap with neighboring regions to varying degrees. By examining these regions we gain a better understanding of how and why the Mojave Desert is what it is. The Garlock Fault is the defining fault between the Mojave Desert and Sierra Nevada, Basin and Range geomorphic provinces.